This is a vital and important subject for discussion. Guru Sahib has blessed us with such Saroop (appearance) that can’t hide even in hundreds of thousands of people. A Sikh of the Guru stands out because of his hair, beard, turban and dress. These outwardly signs of Khalsa are not such that can be removed at will; they are an integral part of the personality of a Khalsa. Many decades ago, a young Sikh came to UK from India. Due to his appearance, he was unable to go to pubs, clubs and other such places that contrary to Gurmat (the Guru’s teachings). 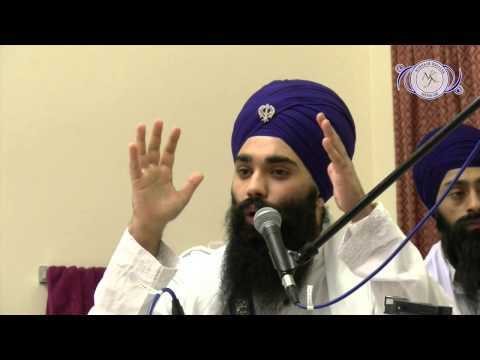 He used to complain a lot and felt that his Sikh appearance was a hindrance to having ‘fun’. Many years later he came back to India and he came back with pure body i.e. he had not committed a major sin. At that point he credited his Sikh appearance for saving his Sikhi. If he did not have a Sikh appearance, he would have surely gone to pubs and clubs and this would have destroyed his Sikhi. A Sikh carries immense responsibility on his or her shoulders, at all times. His/her actions can bring fame or bad name, to not only himself but to the whole community and above all to Guru Sahib. A Sikh is not alone. Guru is always ang-sang (close). Where ever a Sikhs goes, his/her Guru goes with them. Therefore, a Sikh should never go to such place where they would not like to see their Guru going. Continuing from point 1 above, another way of looking at this is that Guru Sahib is always with his Gursikh but if a Gursikh goes to a manmukhi (anti-Gurmat) place, then they should go there at their own peril because Guru Sahib would not accompany them there. They would be without protection of Guru Sahib, if they go to manmukhi places. This should stop a Gursikh from going to a manmukhi venue. Some may argue as to what could happen by just visiting a manmukhi place; for them this Pankiti is given: ਵੜੀਐ ਕਜਲ ਕੋਠੜੀ ਮੁਹੁ ਕਾਲਖ ਭਰੀਐ॥ (If we enter room full of Kajjal (surma, Black powder), our face is most likely to get Blackened). When Sikh girls from villages or cities started going to college (many decades ago), it was common for their fathers to emotionally tell them that they should not do any such action that would stain their turban. A daughter or sister is the “Izzat” (honour) of the whole family. Her bad reputation can ruin the honour of the family for many generations. This one thing alone used to be enough to keep Sikh girls on the righteous path. The same should apply to boys. But now things have changed. Continuing from the previous point, same way, the bad actions of Sikh boys and girls would bring shame to whole Panth (Sikh nation). We are sons and daughters of Guru Sahib. We should not commit any such sin that would stain our Father’s turban. Gurbani is clear on this – ਪ੍ਰਭ ਤੇ ਜਨੁ ਜਾਨੀਜੈ ਜਨ ਤੇ ਸੁਆਮੀ ॥2॥ – Vaheguru is known by his Servants and his Servants are known by their Master. In other words, good actions of Bhagats make Vaheguru proud. Next to Dastaar (turban) wearing Sikh ladies, it is admirable to see our Muslim sisters and daughters cover their heads with the Hijab. They look so pious but now-a-days when we see Hijab-wearing Muslim girls wearing inappropriate clothes (body revealing clothes), our heads are lowered with shame. Same is true for our sisters and daughters who wear Dastar (turban) but don’t even have second thoughts when they wear skin tight pants and tops that reveal their bodies. In Gurmat, the most appropriate attire is Baana (traditional attire) of course, but if for whatever reason wearing Baana is not possible, then at least the attire they wear should be such that it does not reveal their body. Only such pious ladies who obey this Hukam (Order) can be called proud daughters of Siri Guru Gobind Singh jee. For young Sikh men and boys, the most appropriate attire is Baana but if they are not wearing Baana for whatever reason, they should wear simple clothes and not flashy clothes. Some like to show-off their muscles and wear tight clothes. All this is manmukhi behaviour that should be avoided by true seekers of Guru Sahib. « What is the goal of human life?